According to a recent study by CNBC, 8% of U.S. workplaces are now “pet friendly environments.” What this means is that more and more owners are now able to lessen the anxiety their pets feel when they are separated from their masters. What it also means is that offices must face special challenges when it comes to keeping the workplace clean and sanitary. 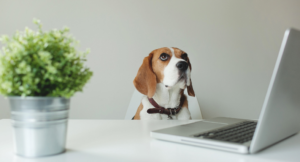 If your workplace has recently become pet friendly, you may wish to use the following tips to ensure that your office stays safe and clean for humans and their four legged friends. Work with management to establish guidelines: Before you decide to make your office pet friendly you need to make few decisions. First, decide which pets you will let in your office and which areas they will be permitted to occupy. Also, you may wish to poll your workers to see if any of them have allergies to pet dander. Finally, you should establish employee guidelines on cleaning up after pets. Notify your cleaning crew of this policy: Obviously, cleaning up after pets will present unique challenges to your employees and your cleaning crew. Our office cleaning services in the inland empire can handle stains and other accidents caused by pets as we are seeing more and more offices where pets are present. Make it easy for owners to clean up after their pets: Have poop bags available so that employees can quickly and easily handle “accidents” as they arise. Choose the right carpets: Experts recommend that you buy a carpet that is designed to repel odors and liquids. This will give you a measure of protection as such carpets are usually easy to clean and sanitize. Act quickly on all accidents: Acting quickly when accidents occur will ensure that you will avoid any long term damage to carpets, furnishings etc. Acting quickly to clean up accidents will also make the workplace more sanitary for all. Have spot cleaning supplies on hand: Although the experts can handle all kinds of office cleaning emergencies, it is helpful for business owners to invest in their own cleaning supplies for their pet friendly office. Have cleaning solutions, brushes, etc., on hand so that you can mitigate any damage that occurs before your experts arrive. We hope the above tips help make your workplace pet friendly and at the same time clean and people/pet safe. We are one of the most experienced and thorough office cleaning companies in Riverside, CA and are ready to make your transition to a pet-friendly office easy and fulfilling.